Thanks to a meteoric growth in panel installations in recent years, Utah is now one of the top states for solar power generation — but industry experts don’t expect the surge to end any time soon. According to an analysis by the Natural Resources Defense Council (NRDC), large-scale solar developments produced 5 percent of all the electricity generated in the state in 2017. 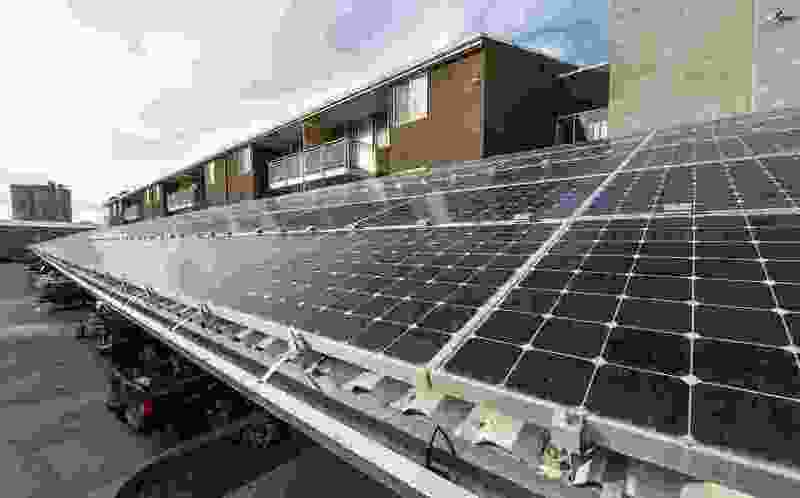 Residential rooftop solar accounted for another 1.5 percent of the state’s generation in that same time period, said Amanda Levin, a climate and energy advocate with the environmental group. Utah is still catching up to other large energy-producing states in terms of total solar output. But as a percentage of total generation capacity, the state now draws a greater share of its power from the sun than all but three other U.S. states: California, Nevada and Vermont. The NRDC report, released Wednesday, was based on data from the U.S. Energy Information Administration. It remains unclear how much of Utah’s solar power is used by the state’s residents. Utah’s electrical utilities export and import electricity, and it’s hard to say which electrons go where. But the total wattage generated by solar farms in Utah is now sufficient to power 300,000 homes, said Ryan Evans, president of the Utah Solar Energy Association, an industry group. Roughly 35,000 additional homes generate their own electricity with rooftop solar panels, Evans said. But the Utah industry’s current growth trajectory suggests the latest numbers are only the beginning of the state’s solar power boom, Levin said. Unlike wind energy, where growth is expected to level off in the next three to four years, she said, solar is expected to continue growing through 2040. Evans, whose association represents about 60 solar-related companies in Utah, was similarly optimistic. “Ultimately we can do very well in this state,” he said. “I would like to think that we could get up to 10 percent of generation really quickly in the coming years, and I can’t see why we couldn’t get to a million homes” powered by solar in the near future. Much of the growth has to do with Utah’s geography, Evans said. It ranks as the fifth-sunniest state in the nation, and there’s a lot of wide, empty land available for building solar farms. Pricing is also a key factor, Levin said, and the main reason solar is expected to continue to grow: The cost to build solar farms continues to fall. In Utah and much of the U.S. Southwest, Levin said, building a new solar farm is often a less expensive option for a utility company needing to replace aging power plants or generate new electricity to meet growing demand. Indeed, Rocky Mountain Power, Utah’s largest utility, has historically relied heavily on coal and other fossil fuels to meet demand. But of late, the multistate company is increasingly looking to renewable energy and has plans to build additional solar farms in Utah in the works. Rocky Mountain Power spokesman Spencer Hall said this is driven as much by customer demand as by cost considerations. Several programs that allow businesses, cities and individuals to invest through the utility in solar energy projects have proven successful, Hall said. In fact, subscriber solar — which allows Utah residents to help directly fund new solar farms — is so popular it currently has a waiting list.